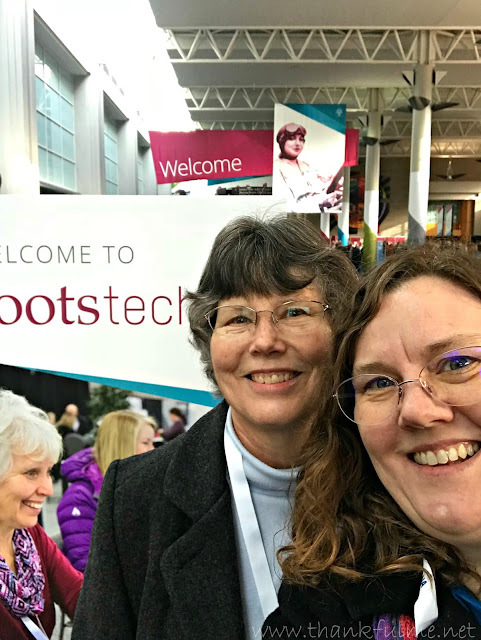 I did something last week that I've never done before--I attended a RootsTech conference. RootsTech 2018 brought together approximately 14,000 attendees to learn and celebrate family history. Gathered in the Salt Palace in Salt Lake City, Utah, we spent four days attending classes, listening to fabulous keynote speakers, visiting vendors at an enormous expo, and meeting friends and relatives. Photo: My mom and I pose in front of a sign. Had I framed the photo correctly, "Welcome to Rootstech" would be visible. My mom flew down to attend the conference, and spent a week with me. We not only had a great time at RootsTech, we also managed to watch a couple of movies (The Greatest Showman, Coco), eat Rockwell ice cream and BYU chocolate-covered cinnamon gummy bears (not simultaneously), and inadvertently photo-bomb a video interview with Scott Hamilton. 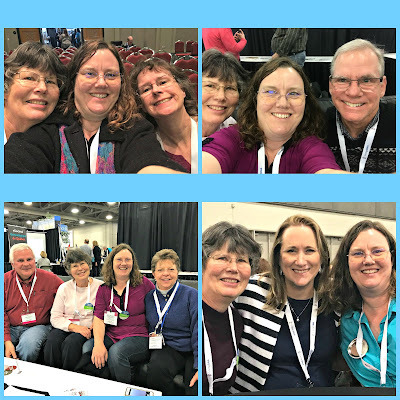 Thanks to a "Find Relatives at RootsTech" feature of the FamilySearch FamilyTree app, I had a list of about 300 of my cousins who were also at the conference! I messaged some of them, and met some in person. One of my cousins had been researching a particular line in the family tree for some time, and was amazed to finally meet someone (me) with my maiden name. Another cousin used to live in the same city I lived in, and we share mutual friends. Yet another had visited Germany and shared a PowerPoint presentation of ancestral places. All of the cousins were happy to connect with us, and to share information. One of the days, I got a text from my oldest son, asking if he and his wife could stay with us over the weekend. Her grandfather had passed away, and the funeral was on Saturday. Of course I said yes. Although the reason for the visit was sad, it was nice to get to see them, too! 6. For even more cousins. 7. For my son and his wife. 8. For my other children. Have you ever attended a family history conference? Have you tried out FamilySearch? If you have a tree (or need help starting one) and want to find out if we are cousins, let me know! I've found a couple of blogging cousins already. It's a small world after all! Sounds like it was a fascinating conference. Yes, it really was. I had no idea how huge it was until last week. Wonderful list of thankfuls. That is so nice that you got to see so many cousins. I could tell you were having a blast at RootsTech from the fun photos you were sharing on Facebook! I'm so glad your Mom got to come and spend the week with you, what a fun experience to share! It sounds like you were making other great memories together too! It's amazing how many new cousins you found! I it great that you were able to provide a place for your son and his wife to stay during the funeral. I know that once your new house is done you will likely have more family eager to visit and see it! Such beautiful surroundings and the house is looking amazing! Our children, and grandchildren are the heart and soul of our lives and often our first prayer and last prayer of the day. I, too, am so thankful for the wonderful kids mine have grown up to be through their own efforts and choices. The cousins I met were mostly distantly related (I think the closest was a 3rd or 4th cousin), but that just goes to remind me that in the human race, we are ALL related. One of the speakers at the conference kept repeating that when we realize we are related, we treat each other differently. Love this family themed post. My uncle is coming from Germany in the fall and I delicately asked if I might ask him some questions when he's here, for the novel I am working on which is loosely based on my oma when she was a young woman, when she had her first three children during the war. I think it's important to keep making an effort with family, to know those you may not have met or aren't so close with.